China men won gold while Japan took silver and Korea bronze at the Pacific-Asia Curling Championships 2014 being held in the Karuizawa Ice Park Curling Hall. China defeated Japan in the gold medal game in front of a crowd of over 300 spectators who had come along to cheer on their hometown team. Japan started the game well as skip Yusuke Morozumi made a draw into the house to score two points in the first end. China blanked the next end and in the third end had the chance to take three points as they looked to promote one of their own stones into a scoring position. This did not come off and they only managed to take one point. China then stole a single point in the next end when Japan skip Yusuke Morozumi, with his last stone, couldn’t get enough power on an angled takeout to remove a counting Chinese stone. Morozumi managed to score a point in the fifth end however as he drew into the house to make the score 3-2 to Japan by the fifth end break. In the sixth end, the Japanese skip made a triple takeout with his first stone before making a tap back with his second stone to limit China to only one point. Then, in the next end, Morozumi played a takeout for one point. The eighth end proved crucial. China skip Jialian Zang placed his first stone behind a guard at the back of the 12 foot ring. Japan’s Morozumi then tried to takeout this stone but missed, allowing Zang to draw into the house to score two points. It went from bad to worse for Japan as in the next end, Morozumi was too heavy with his final draw, giving up a steal of two points to China. 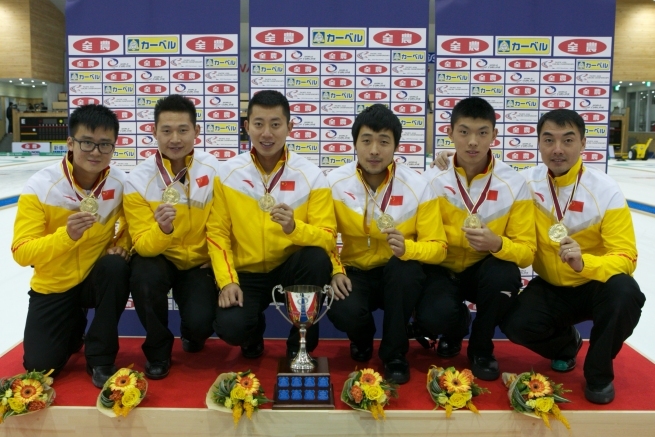 China made sure of their victory in the tenth end when skip Jialiang Zang hit out one of the Japanese stones to score one point, win 7-5 and take the gold medals and the Pacific-Asia Championship title. This was skip Jialiang Zang’s eighth Pacific-Asia Curling Championship gold medal, but first as skip. He was supported by third Dejia Zou, second Dexin Ba, lead Qiang Zou, alternate Jinbo Wang and coach Hongchen Li. 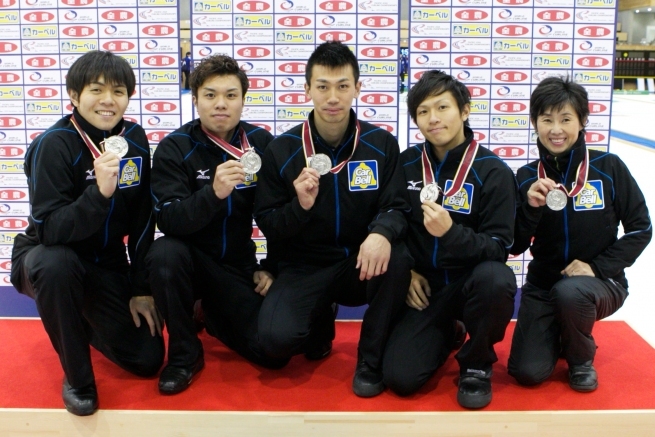 For Japan skip Yusuke Morozumi, this was his team’s fifth silver medal at this Championship. He was supported by third Tsuyoshi Yamaguchi, second Tetsuro Shimizu, lead Kosuke Morozumi and coach Hatomi Nagaoka. 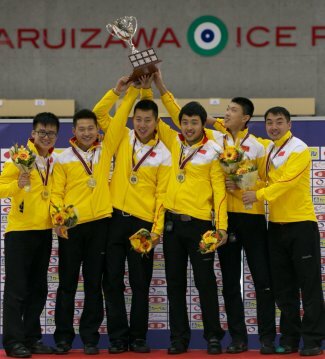 By being the top two placed teams in the Pacific-Asia Curling Championships 2014, both China and Japan have qualified for the Ford World Men’s Curling Championship 2015, which is taking place in Halifax, Canada. In the bronze medal game, Korea took a key advantage against Australia in the third end when skip Soo Hyuk Kim made a takeout for three points. Australian skip Ian Palangio hit back in the next end as he drew into the house to score two points. The next six ends consisted of single points, but in the eighth end Korea took a further step towards victory as Australia skip Ian Palangio was too heavy with his final draw to give up a steal of one point. 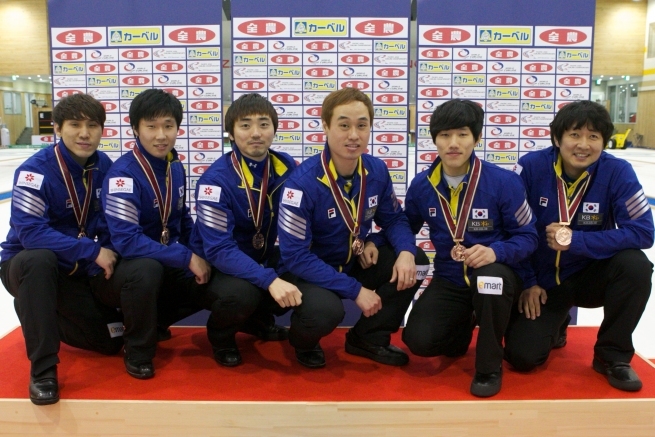 Korea went on to win 7-4, their nation’s eighth medal at the Pacific-Asia Curling Championships. For skip Soo Hyuk Kim, this was his fourth medal at the Pacific-Asia Curling Championships. He was supported by third Tae Hwan Kim, second Jong Duk Park, lead Yoon Ho Nam alternate Min Hyeon Yoo and coach Se Young Yang. Earlier in the day, China women won gold, Korea silver and Japan bronze. Gold: Japan 5, China 7. Bronze: Korea 7, Australia 4. The dates and location for the Pacific-Asia Curling Championships 2015 have yet to be announced. The WCF Olympic Qualification Event in 2017 will give teams who participate in any of the 2014, 2015, 2016 and 2017 World Curling Championships, and do not earn enough Olympic qualification points at either the 2016 and 2017 World Curling Championships, the opportunity to secure the final two places in both the men’s and women’s curling competition at the Pyeongchang 2018 Olympic Winter Games.